Google Instant or SEO? What Will Lead The Way? If you’ve been over to Google this week, you’ve noticed a few changes. Google Instant is providing users with a new way to search, and a new way to get results at a fraction of the time. No longer do you need to type out an entire phrase, hit enter, and view the results. Now it’s a matter of starting to type, and watching the results as you move from letter to letter. Google is actually “predicting” what you want based on the order of the letters. And because Google is going to give you constant feedback as you type, you’re going to be able to adjust and define your search term even further as you type. I decided to do a simple local search for a pizza restaurant. 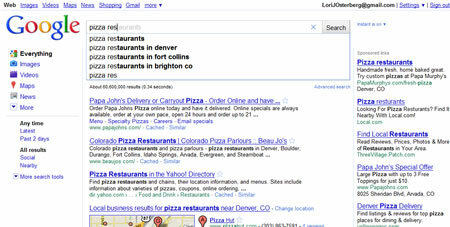 Even when I type in the letter “p”, Google already pulls one of the biggest chains, Pizza Hut. Which also shows that the larger your presence, and the bigger the company, the better your chance will be to come up with Google Instant. By extending out to “piz” Pizza Hut remains in the search, but it also expands out to coupons, and also to pizza dough, giving me the option of making pizza at home. Not only is Google Instant predicting what I’m searching for, but it also can start influencing my decisions. The “pizza hut coupons” result may just sway me to try for coupons since I’m heading out for pizza anyway. Once I get the entire word “pizza” typed in, it begins to give me other options. 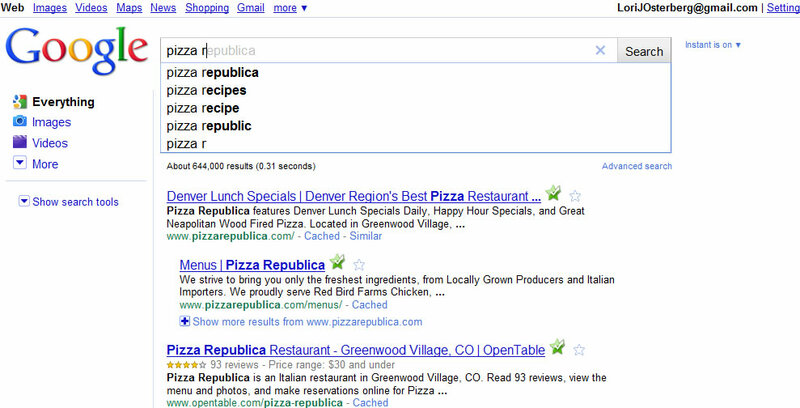 Then when I begin typing in the word restaurant, it starts moving into the local search strategy. Google at that point picks up on the fact I want pizza, and want a restaurant close by to where I’m searching from. So it allows me to pick a city as well. Even though I may have originally been thinking of just “pizza restaurant” as my search phrase, I may now decide that the “pizza restaurant in Denver” sounds even better, and choose to click on that instead. So how will that affect SEO? It depends on how well you’ve been using SEO techniques in the past, and what Google Instant continues to predict. While Google will always pull based on quality content, your ideas may now be swayed by what Google Instant is showing. So the key to your web presence now more than ever is providing quality content, and covering as many long tail phrases as possible.